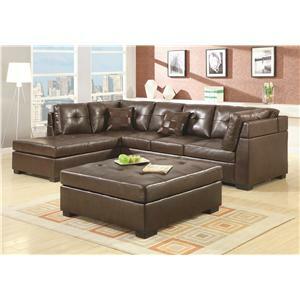 Get creative in your living room or family room with the unique design of this contemporary four-piece sectional sofa. 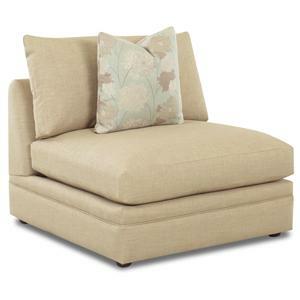 Composed of an armless chair, armless loveseat, and two corner chairs, creates a flawless modern piece that will look amazing in any home. 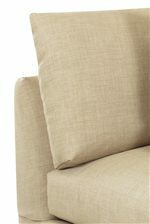 The corner chair placed on the right end creates a convenient arm, allowing you to cuddle up to a book or a favorite movie. 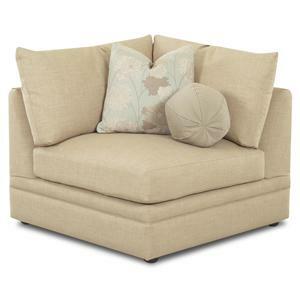 The thick seat cushions and the plush loose back pillows will provide you with luxurious comfort and an inviting atmosphere your guests will appreciate. Five square arm pillows and two ball pillows are available with this piece to further the decor of your home while creating added convenience while you are relaxing. 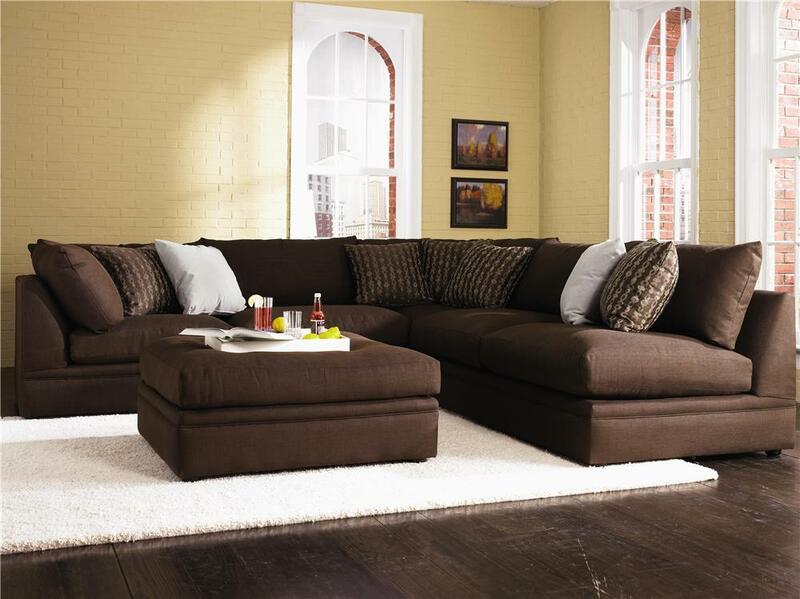 Create your own composition with the pieces from this sectional and create a look that is perfect for the space in your living room. 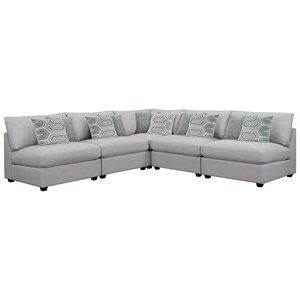 The Melrose Place 4-Piece Sectional with Two Corner Chairs by Klaussner at Value City Furniture in the New Jersey, NJ, Staten Island, Hoboken area. Product availability may vary. Contact us for the most current availability on this product. Padding & Ergonomics Down blend seat and back cushions. 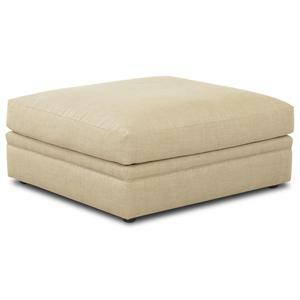 Seat cushions made of special density & compression foam at least 1.8 density, wrapped in Dacron or convoluted foam. Arms padded with foam or white polyester cotton. Contour of arm formed with edge roll. 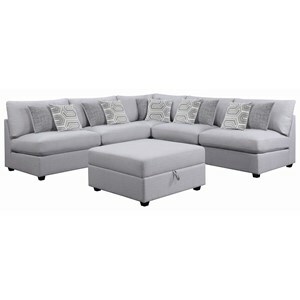 Bring the family together with the Melrose Place sectional sofas and individual pieces that will further the decor of your home while creating a comfortable place to relax. 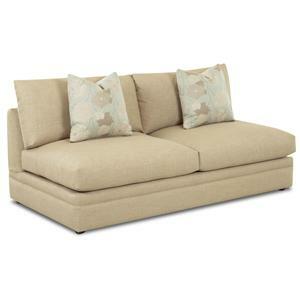 Detailed with scatterback pillows and expansive seat cushions that add up to comfort and style, the contemporary pieces will look flawless in any home. 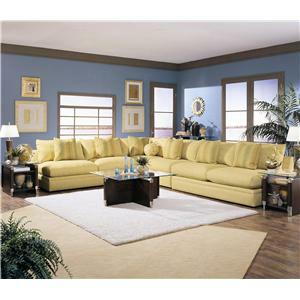 This collection will allow you to use your imagination to create and recreate sectional compositions that are perfect your the space and style of your home. The pure simplicity is highlighted through straight soft lines, while the whole composition of each piece transpires into a modern look. Thick plush cushions create an inviting and a warming atmosphere your guests will appreciate, creating a home with allure and luxurious comfort. 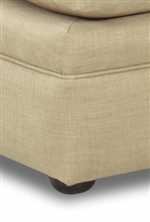 This collection is available in custom fabric finishes, allowing you to choose the style of your home. 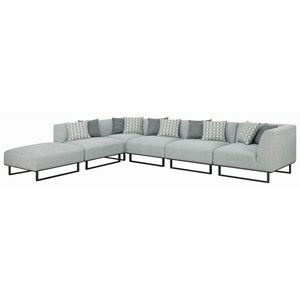 The Melrose Place collection is a great option if you are looking for Contemporary furniture in the New Jersey, NJ, Staten Island, Hoboken area. 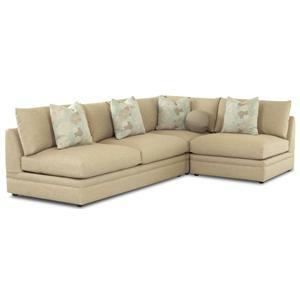 Browse other items in the Melrose Place collection from Value City Furniture in the New Jersey, NJ, Staten Island, Hoboken area.